Our Gemologist searches for unique fine jewelry to inspire, delight, and evoke emotion. Let us be your source for Gemstones and Diamonds? 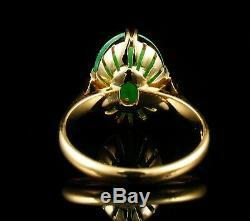 Rare, Authentic, Genuine, Antique, Vintage, Estate, one of a Kind, and Designer Signed, Fine Jewelry! Fine jewelry is a personal and artistic expression not only by the artisan creating such beauty but from the one who seeks to share such beauty with a loved one. The moment it is shared will be forever remembered. Let us assist you in making your heartfelt sentiment one to be cherished. Just what you were looking for? For What Is More Delightful than Owning a Beautiful Piece of Art is Winning It at an Unbelievable Price? 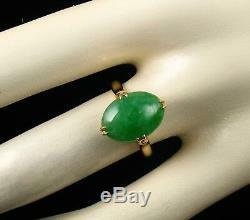 LEE SIGNED ART DECO VINTAGE FINE NATURAL 5.36ct UNTREATED UNDYED GREEN JADEITE JADE SOLID 18K YELLOW GOLD RING. (Retail value is the actual current retail cost or an estimated retail value). ART DECO / VINTAGE - 1930's - 1940's. 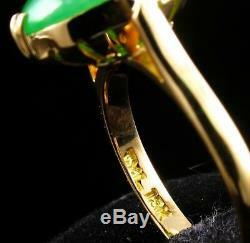 SOLID 18K YELLOW GOLD (NOT PLATED OR FILLED). 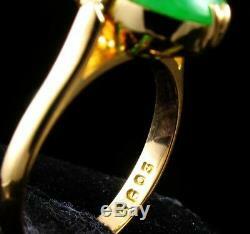 (All metals have been tested and or are stamped and guaranteed to be as described). 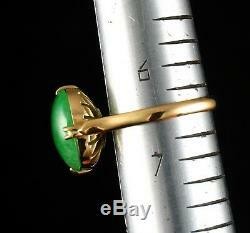 14.5mm (Long) X 19.1mm (Shoulder to Shoulder) X 9.0mm (High off the Finger). 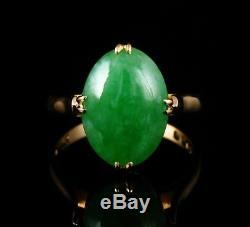 ONE (1) OVAL CABOCHON CUT NATURAL UNTREATED UNDYED FINE GREEN JADEITE JADE. BEAUTIFUL MOTTLED IMPERIAL GREEN COLOR, VERY CLEAN, SEMI TRANSPARENT WITH EXCELLENT COLOR SATURATION AND A BEAUTIFUL HIGH POLISH AND LUSTER. CARAT WEIGHT OF 5.36ct. 13.5MM X 10.0MM X 4.0MM. 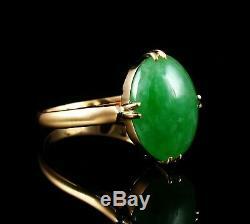 VERY FINE RARE NATURAL JADEITE JADE, NATURAL COLOR, NO TREATMENTS, NO DYES OR ENHANCEMENTS WHATSOEVER! 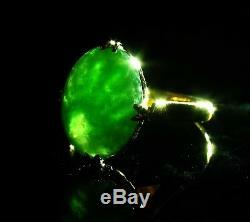 TOTAL GEMSTONE WEIGHT: 5.36ct. 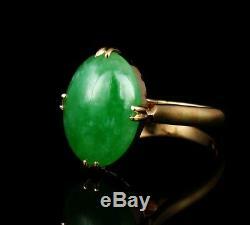 A VERY RARE ESTATE FIND, GORGEOUS NATURAL UNTREATED JADEITE JADE. 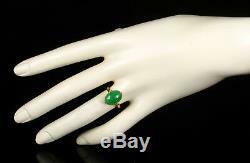 A HIGHER GRADE OF JADEITE, MOST T. LEE PIECES ARE SET IN 14K GOLD, THIS T. Y LEE RING IS SET IN SOLID 18K GOLD AND USES A FINER QUALITY NATURAL JADE THAT IS 100% NATURAL WITH NO TREATMENTS OR ENHANCEMENTS. 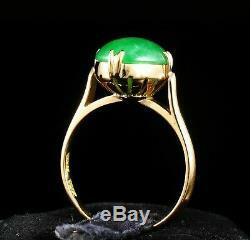 JADE OF THIS QUALITY IS VERY HARD TO FIND AND BECOMING INCREASINGLY MORE VALUABLE, GOING UP HUNDREDS TO THOUSANDS OF DOLLARS PER CARAT OVER THE LAST 80 YEARS. Please note: gemstone and diamond color may vary from one computer monitor to another. All mounted gemstone weights, grading and measurements are approximate to preserve the integrity of the setting unless otherwise stated. SHOULD YOU HAVE ANY QUESTIONS OR CONCERNS PLEASE DO NOT HESITATE TO ASK US WE WILL BE HAPPY TO HELP. This way we can help make sure that no damage will occur to the ring by sizing. Sizing may take up to a week to be completed depending on time of year or complexity of job. Thank You for Visiting Our Select-Gems Store. Our selection of fine jewelry changes often. We pride ourselves in offering unique, one of a kind, designer, vintage, or estate pieces. Therefore, if an item sparks your interest for yourself or loved one, be mindful it may be difficult to find that item at another time. All Gemstones and Diamonds are completely natural, untreated and unenhanced unless otherwise stated. Every piece has been professionally cleaned, polished and examined by our Master Jeweler to be as described and has been brought to showroom new condition. Some delicate, vintage and or antique pieces can only be cleaned or restored to a certain extent without possible damage to the piece. 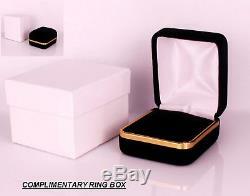 Every item is sent in a classic new gift box ready for gift giving, presentation, or display.